The Crosman or Benjamin Marauder is the flagship pellet gun and a top seller. It’s a fantastic hunting gun or target shooter. It’s very powerful and accurate. The Marauder is a PCP or Pre Charged Pneumatic type gun which means you fill its air tank or reservoir with compressed air from an air pump or air tank. It holds about 3000 psi and enables you to shoot about 20-25 .177 or 16 .22 pellets before recharging. 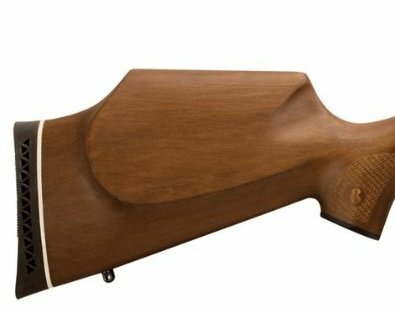 The stock is a Monte Carlo sporter hard wood stock with a ventilated recoil pad. The Marauder is a repeater which means it has a magazine or clip that holds pellets. The magazine holds 10 pellets. You can shoot 10 pellets without reloading. All you have to do is cycle the bolt and pull the trigger. Crosman 10 shot pellet magazine. 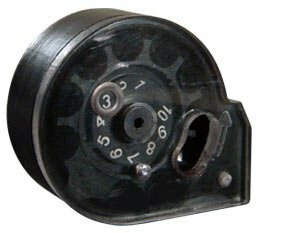 The barrel is rifled, shrouded and choked to reduce noise and vibration. 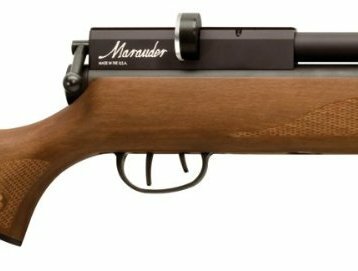 It is the most accurate and quietest air rifle in its class. The match trigger is 2 stage and adjustable. There is a dovetail in the receiver for scope mounting. Velocity is 1,100 with pellets. This is a fantastic gun for small game hunting with plenty of power. The wood stock is beautiful and balances well. This rifle is first class all the way. Sling swivels are also included. The Marauder has a 4 star rating out of 5 stars from customers. Some of their comments are; powerful, quiet, accurate, 5 shots in a 3/4″ group, very quiet, great for hunting squirrels, well made, trigger is a gem, almost zero kick or recoil. Click Here to Save Over 30% on the Crosman Marauder .177 Pellet Gun or to the Read Reviews. So how quiet is the Benjamin Marauder Pellet Gun? Watch this video and find out. This entry was posted in PCP Guns by admin. Bookmark the permalink.